Michael Pollan's recent book, Omnivore's Dilemma, has moved several conversations forward. Perhaps it took an eloquent partisan of a counter-cultural food philosophy to explain, precisely and without prejudice, the strengths and limitations of the official definition of "organic," and to sort through the various contenders for a "post-organic" alternative food philosophy. I am still reading the book, and holding on to the edge of my (subway) seat each morning and evening, eager to hear the conclusion of this sorting. Mother Jones magazine has a good excerpt from the book and some photographs from Joel Salatin's Polyface Farm, which anchors some of the most interesting sections of Omnivore's Dilemma. Chef Ann Cooper's weblog quotes from Katherine Mangu-Ward of the Wall Street Journal, who covered the progress and, again, troubling ironies implied by organic food from Wal-Mart. Jack from Fork and Bottle wrote to point out the interesting exchange between Pollan and Whole Foods' founder, CEO, and weblogger John Mackey. The exchange was covered in Grist, and in a thread on the Slow Foods Forums. Jack has been reorganizing and revitalizing those forums, so now would be a good time to register if you are not already a member. USDA's inspector general last week called on the department to enhance its plan for responding to a potential outbreak of avian influenza. The poultry industry currently performs voluntary testing of its flocks, but the inspector general's new report (.pdf) recommended improved oversight of "live bird" markets and stronger preparations for providing vaccines to people who would have to respond to an outbreak. The Department agreed that the inspector general's report provided an accurate view of its capabilities at the time of the audit. Congress has allocated $91 million in new funding for avian influenza work, so readiness may improve. Poultry experts said in January that if the lethal flu strain arrived in American domestic poultry, complicated tests would not be needed to spot it. Unlike other bird flus, the A(H5N1) strain, which has killed millions of chickens and 130 people since 2003, can wipe out a flock of thousands in 24 hours. To monitor avian influenza issues, I frequently read the weblog Effect Measure, which has a new address. I know, dear reader, that you get nervous when food policy advocates overstep their bounds. While you may tolerate public policy to address newfangled hazards like trans fats or high fructose corn syrup or the prions that cause "Mad Cow Disease," you draw the line with traditional historically accepted foods. Still, give this one a chance to rattle around your brain for a day or two. Even if you are generally skeptical of policy responses, except in cases where truly large numbers of lives might be saved, then this issue makes the cut. Last year, when the Center for Science in the Public Interest (CSPI) was quoted taking a lonely position in favor of new policies on salt, I couldn't help noticing the good rhetorical points the group scored. For example, given that hypertension and heart disease are top-ranked killers, do admit it is a bit ironic that the lack of policy regulation for salt is officially justified by its FDA classification as "Generally Recognized as Safe (GRAS)." Now, the sober professional representatives of our family doctors (and their pharmaceutical companies) have taken a similar stand. The American Medical Association (AMA) this month called for several new policies on sodium (Associated Press). Excess sodium greatly increases the chance of developing hypertension, heart disease, and stroke. Research shows most Americans consume two to three times the amount of sodium that is healthy, with an estimated 75 to 80 percent of the daily intake of sodium coming from processed and restaurant foods. "Just one cup of canned soup can contain more than 50 percent of the FDA recommended daily allowance," explains Dr. Rohack. "A serving of lasagna in a restaurant can put a diner over their recommended daily sodium allowance in just one meal. These examples stress the importance of a national reduction in the amount of sodium in processed and restaurant foods." discussing with the FDA ways to improve labeling to assist consumers in understanding the amount of sodium contained in processed food products and to develop label markings and warnings for foods high in sodium. The AMA is confident the implementation of these recommendations would reduce sodium intake, result in a better educated consumer, and eventually lower the incidence of hypertension and cardiovascular disease in this country. Are you surprised that Nestle would purchase Jenny Craig? "Chocolate maker Nestle SA said Monday that it would purchase weight-loss-product maker Jenny Craig Inc. for $600 million," the Associated Press reported in a story datelined tomorrow (via Washington Post). The biggest food and restaurant corporations would be quite worried if nutrition and wellness goals encouraged Americans to slow down a bit, cook more food at home, eat fewer meals in restaurants, and base their meals around fruits, vegetables, and whole grains, with meat as a secondary side dish. A healthy approach to food might imply less profitable "value added," especially for the mega-corporations. Dieting, by contrast, is a gold mine. People who fall for fad diets spend millions on shakes and pre-packaged meals. And, paradoxically, there is no evidence that most dieters even reduce their food intake in the long run of 12 months or more. In a deal that is scheduled to take effect July 1, the federal government's National Pork Board plans to purchase rights to the "Other White Meat" brand from the National Pork Producers Council, a private trade association, for $60 million. The deal will not help pork producers improve demand for their product, because the Pork Board already uses the "Other White Meat" slogan in well-known national advertising campaigns. Instead, the sale will circumvent federal restrictions on how the National Pork Board may use money that it collects in taxes or mandatory assessments on pork producers and importers. The sale will funnel $3 million each year for 20 years to the National Pork Producers Council, a private industry association whose heavy influence over the federal government's Pork Board has long been controversial. The Council, in turn, can spend the $60 million without federal government oversight. The general description of the sale was provided in a press release from the National Pork Board in March, and the latest news was reported by Brownfield Ag News on Friday. The National Pork Board was established by Congress in 1985, and the Board members are appointed by the Secretary of Agriculture. As with other "checkoff" promotion programs, the federal government enforces the collection of the mandatory assessments, amounting in the case of pork to more than $60 million per year. Some pork farmers oppose these industry schemes (see here and here), but even a successful referendum to end the program was overturned through the influence of the Council. Government and industry officials sometimes describe the Board as a producer self-help organization, but its role as a government program was finally settled by the Supreme Court in a May, 2005, ruling on the related beef "checkoff" program. In this case, the federal government argued -- and the Supreme Court agreed -- that such government sponsored advertising campaigns for dairy, beef, and pork are "government speech" and farmers must pay the mandatory assessments as they would any government tax. Our evaluation did not disclose material misuse or loss of checkoff funds, but it did find the Board has relinquished too much authority to its primary contractor, the National Pork Producers Council (NPPC), and has placed the NPPC in a position to exert undue influence over Board budgets and grant proposals. The Board has awarded all program grants to the NPPC since 1996. The Board itself has not hired sufficient staff to administer and provide adequate oversight of the checkoff program. The Board employs only two persons (an Executive Vice President and an assistant), to oversee $60 million in annual checkoff collections, distribution, and use. The Board's degree of dependence on the NPPC to administer subcontracts and carry out much of the Board's work resulted in a weakened accountability over contributed funds. In response to the Inspector General's report and related litigation, USDA began to insist (.pdf) that the Board's operations be strengthened and that contracting relationships between the Pork Board and the National Pork Producers Council have an "arm's length character." For example, the Pork Board staff moved out of the National Pork Producers Council's office to a nearby location leased from the Council. It is not clear whether the new proposed sale of the "Other White Meat" brand has an "arm's length" character. The press release from the National Pork Board claims that the $60 million sale price is based on unspecified "appraisals." The press release argues that this price reflects the cost of replacing the "Other White Meat" brand, should the Pork Board choose to develop a new brand instead. That reasoning is questionable, however, because much of the intangible equity in the "Other White Meat" brand comes from the investment of millions of dollars per year in advertising funded by the Pork Board, not by the National Pork Producers Council. The Council has nobody else to whom it could sell the brand, so it is hard to imagine there are any competitors bidding up the price of the brand. Until the documents are made public, one has to suspect these "appraisals" are just window dressing for an insider deal to benefit the National Pork Producers Council. Clearly, it is important for the public to see these appraisals before the deal is completed. Otherwise, the miscarriage of the public interest will be apparent only after it is too late to reverse the decision. 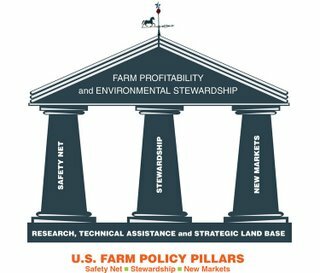 Unfortunately, in response to repeated inquiries of both program and public information staff at the Agricultural Marketing Service at USDA, nobody would answer my questions or provide the appraisals. Consequently, I filed a Freedom of Information Act request in April, requesting these documents. The response I received today is clever. It says USDA has found 12 pages of documents that are responsive to my request for information, but 10 of those pages are being withheld from the public for now because they are "pre-decisional" or "deliberative." These will be shared with the public as soon as USDA finalizes the deal -- when the information will be too late to do any good. What were the 2 pages that USDA did share with me? A photocopy of the National Pork Board's press release from March! In the never-ending struggle between those who would share information needed for sound public policy, and those who would hide it, I feel that I have been beaten by a real talent. Perhaps a sharper reporter will pick up this story before the USDA approval is finalized. 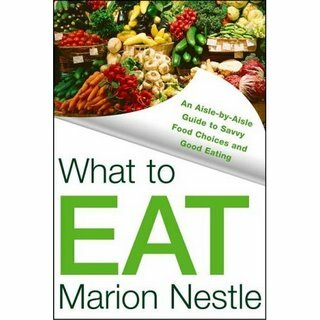 Marion Nestle: What to Eat? Marion Nestle asks some good questions about supermarkets in the introduction to her new book, What to Eat. Why, I wondered, do they sell this and not that? Why are entire aisles devoted to soft drinks and snack foods? What do the pricing signs mean, and how do they work? Why is it so hard to find some things, but not others? Are there any genetically modified or irradiated foods among the fruits and vegetables? What does "Certified Organic" mean, can it be trusted, and is it worth the higher price? Is soy milk healthier than cow's milk? If an egg is "United Egg Producers Certified," is it better? Is it safe to eat farmed fish or, for that matter, any fish at all? Is it safe to eat take-out foods? If a sugary cereal sports a label saying it is whole grain, is it better for you? Does it make any real nutritional difference whether you buy white or whole wheat bread? And she offers this interesting reflection on difficulty that she, Marion Nestle, Ph.D., chair of a leading nutrition department, author of several lucid and influential books on related topics, faces in answering such questions. If you have trouble dealing with supermarkets, it is for a good reason. You need to know an amazing amount about our food system and about nutrition to make intelligent choices, but most of this information is anything but obvious. It is not supposed to be obvious. Supermarkets have one purpose and one purpose only: to sell food and make a profit, and as large a profit as possible. Your goals are more complicated: you want foods that are good for your health, but you also want them to taste good, to be affordable, to be convenient to eat, and to reflect social values that you might care about. In theory, your goals could overlap with the normal business interests of supermarkets. After all, they do sell plenty of inexpensive, convenient, tasty foods that are good for you. But in practice, you and the supermarket are likely to be at cross-purposes. The foods that sell best and bring in the most profits are not necessarily the ones that are best for your health, and the conflict between health and business goals is at the root of public confusion about food choices. Here is an NPR interview with the author. From Fox Searchlight Pictures, on YouTube, here is the amusing trailer for Fast Food Nation. My wife and I both liked Schlosser's book. Plus, we like director Linklater and -- this is the embarrassing part -- we enjoyed Ethan Hawke's work for him in Before Sunrise and Before Sunset. The rest of the cast includes Kris Kristofferson, Avril Lavigne, Patricia Arquette, and more. Fall 2006. But why did they bleep out the tag line, "There's something in the meat"? The 2007 Farm Bill proposal from the American Farmland Trust has three pillars: (1) a safety net, emphasizing non-trade-distorting "green payments" and risk-management tools, (2) stewardship policies, including conservation programs, and (3) new markets, by which the Trust appears to mean even-handed reciprocal trade access and increasing the profile of fruit and vegetable crops that have not traditionally been program crops. A long-standing unwritten rule or tradition at USDA limits what nutrition educators can say. One may speak freely about foods that are encouraged, such as fruits and vegetables and whole grains. One may speak in general terms about limiting vague nutrients, such as saturated fat. However, one may not speak too plainly about reducing or limiting particular food groups, such as meat or high-fat dairy. USDA promotes those foods. 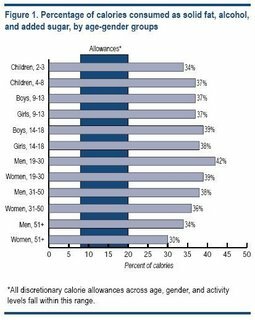 An interesting report (.pdf) this month from USDA's Center for Nutrition Policy and Promotion approaches the limits of permitted boldness. The title emphasizes what to eat less: "Americans consume too many calories from solid fat, alcohol, and added sugar." The revised Dietary Guidelines for Americans and the new MyPyramid graphic received some critical comment for introducing the concept of "discretionary calories." The idea is that, if you are an active person with high energy (calorie) needs, and you have already chosen enough healthy foods to meet your other nutrient needs, you might feel free to fill out the remainder of your energy needs with some treats. Most nutrition educators actually agree with the science behind this concept, I think, but many worried it would imply endorsement for all sorts of unhealthy foods. The real question was whether USDA's nutrition communicators would make clear the limits on the recommended amounts of these discretionary calories. This month's report seems fairly clear. 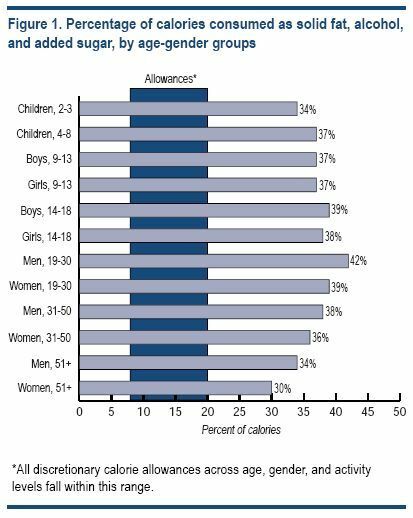 While recommended discretionary calories for certain age and gender groups might reach as high as 20 percent of all food energy, the accompanying graphic shows that American intake of unnecessary sugar, alcohol, and solid fats is vastly higher. In keeping with the tradition of mentioning nutrients in an opaque way without criticizing particular foods, the report uses the bulky acronym SoFAAS to indicate solid fats, alcohol, and added sugars. Beyond that acronym, would the report courageously mention particular foods to eat less? Well,... er,.... "Future research will focus on ... examining the sources of these calories, and applying the concept of SoFAAS to identify the nutrient density of various foods."